Are you building a brand for here and now or a legacy brand? Are you building a brand for here and now or a legacy brand? 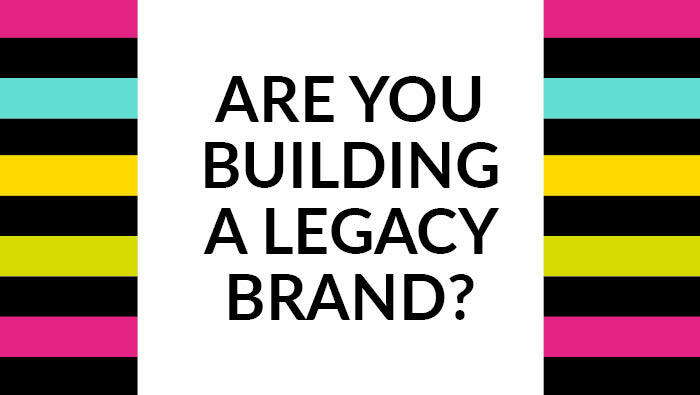 Getting really clear about what your brand legacy will be is so important, especially if your goal is to build a long-lasting, outstanding business. Over the last few weeks the 1980s boy band BROS made a comeback, and unless you’ve been living in a bubble, you will have seen them all over social media, the press and on every chat show in the UK. Back in the day BROS were one of the biggest boy bands and played something phenomenal like 18 sell-out nights back to back at Wembley – it had never been done before. 77,000 fans and 17 million records sold – wow. Needless to say I was a massive fan. I was a Brossette, as we were known. I had the Grolsch tops on my shoes, my jeans were imprinted with their logo, I had them all over my walls and I was totally convinced that I would marry the lead singer, Matt Goss. Part of me still thinks that WILL happen! They wore leather jackets, brogues, white t-shirts – they had a style, their OWN brand. I loved BROS and I wore my cassette tape out fast-forwarding and rewinding so I could sing along to When Will I be Famous in my bedroom with my hairbrush with them plastered all over my walls – I was only 10 – crikey I just realised, do you know what a cassette tape is!! As they announced their 30th Anniversary Tour, us Brossettes went into a frenzy. When the tickets were released, they sold out in 7 seconds – 7 seconds! I mean really. It’s gone down in history as the fastest selling show in O2 history. 30 years on, I still love them and the best part is I got a set of those tickets for their O2 show in London – I am so excited! My husband thinks I’m sad and my friend, Nicola, who’s getting dragged along with me, had to explain to her millennial work colleagues who they were/are! But what a legacy right? I mean how the hell do you top that? Musicians especially create a legacy that will last forever, music to be remembered by and records broken, dress styles, music styles and their own personal branding. So what are you going to leave behind? What will your legacy be? What lasting impression and impact do you want to make? What do you want to be remembered for? What do you want to make people talk about? What do you want people to say about you? This is so important in terms of your business and building your brand. The likes of Richard Branson, Mark Zuckerberg, Oprah… they’re leaving a legacy. A legacy that gets everyone talking, thinking differently and changing people’s lives. Ultimately they change the way people feel. I’m always striving to help people, help women change how they feel about their branding and change how they then go on to do business. I want to be the best branding designer out there that helps women in business all over the world. That’s what I want to do. I want to see good design everywhere. I get so annoyed at bad design, it distresses me and annoys me because I know what is possible and I WANT to help. I want to be the go-to girl. And I want to be doing this for the next 10-15 years. I love what I do. And I want to leave a legacy. I want to be the girl that people talk about in years to come. The Huffington Post published a top 50 women to follow earlier this month. Want to get on that list? I do. That’s the goal. Always striving. So think about your legacy and how that will have an impact on your fans/customers/followers in years to come. How will you change lives and how will you do it? Through creating, through singing, through coaching, through teaching? Will you create a blog, will it reflect your brilliance and your passion? Will you submit articles to the HuffPost? Will you launch a never-been-done-before course? What will you do? What is your purpose? Will you leave a positive impact on the world? What will you strive to be excellent at? Once you figure out what legacy you want to leave, it will make you decide how you want to conduct your business and serve your tribe today. Take action today – write down what you want to be known for, how do you want to make people feel? Once you’ve defined this, make this your soul purpose and the basis of your business. This will help you gain real clarity about who you are as a brand.